← How to Linearize PDF by Command Line? What are the differences between PDF linearization and PDF compression? For fast viewing PDF no matter used in website designing or PDF transmission, we can try to get PDF linearization and PDF compression together. In this article VeryPDF will give some tips and introduce some tools to optimize PDF for minimum file size while still maintaining accessibility and search engine visibility. - Display the first page very fast even if the fully downloading has not been finished. - You can not view the whole PDF, one page at a time. But you can view a page range when those pages has been downloaded.Say you can view 4-7 without downloading page 1-3. We also call PDF Linearization as “Fast Web View” function. When you use this function, please make sure you have PDF reader installed.If you do not use Adobe Reader, please make sure your PDF reader has enabled “Allow Fast Web View” and "Allow speculative downloading in the background". When you need this kind of tool, please try PDF Linearization Optimizer Command Line, which can help you do PDF linearization. Now there is three versions for you to choose: single user version, developer version and server version. And it only sells at $49.00. Compressed PDF size will be obviously smaller that the original PDF file. When compress PDF file, software will try to compress it by compressing fonts, compress image separately. By this way, the compression can be done in a high efficiency way meanwhile keeping good quality. When compress those data, it refers to reduce size of electronic data. Specifically, it means reducing the number of bits that data occupies. VeryPDF PDF Compressor is such a compression tool, which can compress data in different aspects. Now let us have a check from its software interface. 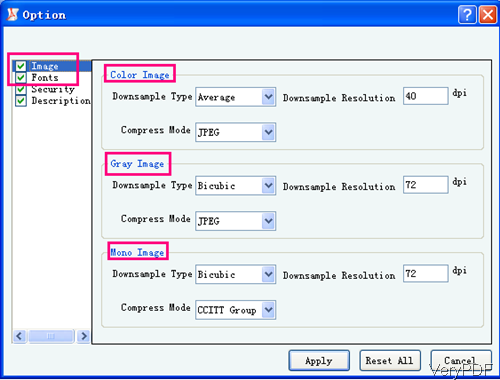 When you need to compress PDF file, it allows you to compress fonts, color image, gray image, mono image separately. And it options to choose many compression method according to your needs. And it only sells at $29.95. When encountering PDF file with huge size, why not try to compress it first and then do PDF linearization. By this method, I guess you do not need to worry to enhance website viewing speed in the cost of reducing the PDF quality. During the using of those two software, if you encounter any problems, please contact us as soon as possible. How to linearize PDF files? How to Enable Fast Web View in a PDF file? How to compress color images, grayscale images and monochrome images in PDF files? This entry was posted in PDF Compressor and tagged PDF linearization. Bookmark the permalink.